In today’s complex world of formulations, diatomaceous earth lightweight fillers have reached economic importance because they offer distinct property advantages and are cost effective. The traditional role of these functional fillers as bulking agents and extenders for cost reduction at the expense of performance has given way to the highly technical design of desired properties for specific product applications. As product applications and uses become more sophisticated and functional fillers take on a more prominent role, the trend is toward mixtures of fillers and binders that yield desired properties at the lowest cost. Diatomite occupies up to 30% more volume per-pound than most competing minerals. This advantage is critical in those applications requiring light weighting. We are one of only a few companies in the world that manufacture a complete line of diatomite functional fillers. Our lightweight fillers are grouped into three categories based on the nature of the processing. Products in these groups are classified according to color, surface area, hardness, and particle characteristics. The effective density of Dicalite diatomite fillers is 1.98 to 2.33 gm/cc—among the lowest of any mineral filler! Through decades of proven research and technical assistance, our teams have demonstrated the broad practical experience in the manufacture, design, and testing of a number of diverse filler products. 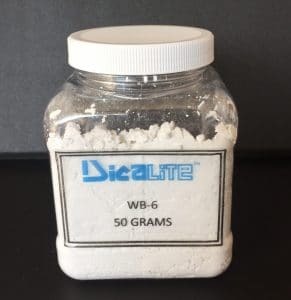 Our technical, sales, and customer service personnel are dedicated to assisting you in the evaluation and performance of Dicalite products in your applications to provide you with an effective and efficient functional filler. Recognizing that each application and use offers its own set of challenges, we provide a full range of expertise and capabilities, and would welcome an opportunity to work with you.